Vice President Mike Pence speaks before the National Space Council at the National Defense University in Washington D.C. on Oct. 23, 2018. During the fourth public meeting of the newly revived National Space Council, chairman Mike Pence and other council members described the path forward needed to develop a sixth branch of the military known as the U.S. Space Force. Pence, who is also the U.S. vice president, gave the opening remarks at the meeting Oct. 23, which was held at the National Defense University in Washington. Pence emphasized at the meeting that space is a war-fighting domain, and that the disorganization of many different branches of government managing U.S. space resources could prove dangerous as other countries mobilize to try and disable the nation’s space assets. "I believe the time has come to stop studying the problem and start fixing it," he added. "The United States Space Force, we believe, is central to the solution that America needs." 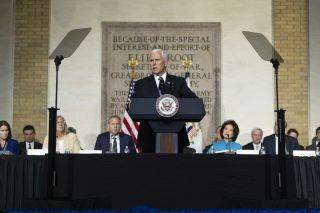 Pence described six recommendations the council planned to send to President Donald Trump, invited updates on the status of the council's previous projects and asked for testimony from three experts who supported the country's need for a Space Force. Create a new, unified U.S. Space Command to establish a chain of command for Space Force operations and determine the doctrine, tactics and procedures for space war fighting in the 21st century. Have the Secretary of Defense create a joint space development agency to cut through bureaucracy and make space technology quickly available when the Space Force needs it. Work with the National Security Council to conduct a comprehensive review of the current interagency authorities to make sure war fighters can react flexibly to stop threats to security in space. Direct the creation of a legislative proposal for the Space Force. Address the 2020 budget, which will allow for the Space Force's creation. Strengthen the relationship between the intelligence community and the Space Force. Deputy Secretary of Commerce Karen Dunn Kelly added that her department just submitted (on Oct. 22) a draft for a rule that would simplify the use of cameras in space, exempting certain pre-approved activities from the long review process — also working toward SPD2. (SpaceX was recently caught in a regulatory snag that led to its post-launch footage from the rocket leaving Earth being abruptly cut off.) The department also sent a legislative proposal to create a consolidated bureau of space commerce, leading to a one-stop shop for space commerce regulation. The Department of Commerce has also been working with the Department of Defense to understand how it tracks dangerous space debris (as part of Space Policy Directive 3, discussed by the council in June). In regard to Space Policy Directive 1 — released when President Trump formally announced in December 2017 that the U.S. was headed back to the moon — NASA Administrator Jim Bridenstine spoke passionately about the Lunar Gateway infrastructure under development to get into lunar orbit and, eventually, down to the moon's surface. "Two weeks ago I was in Bremen, Germany, for the International Astronautical Congress," Bridenstine said. "I met with the heads of 24 different space agencies, and I had the opportunity to speak in front of international forums. And in each one, when I talked about the United States leading an international effort to get back to the moon, the response is overwhelming and it's spontaneous." "People around the world have been waiting for the United States to get back to the moon, and to lead a collaboration, much like we have done on the International Space Station, but to develop a much bigger and broader architecture to the moon, to retire risk, to prove technologies, to prove human physiology and then take all of that architecture on to Mars," he added. Bridenstine also emphasized that crewed flights to the International Space Station would pick back up in December, after the "single most successful failed launch we could have imagined" a few weeks ago. He discussed how important it was that low Earth orbit become a commercialized space and said that the Space Force was critical to protecting the $383 billion space industry. James Ellis, the chairman of the council's think tank-like Users' Advisory Group, discussed how they're analyzing proposed organizational ideas and thinking of opportunities for outreach and education. Next, the council heard testimonials from Doug Loverro, who was the deputy assistant secretary of defense for space policy during the Obama administration; Mark Sirangelo, the University of Colorado, Boulder, entrepreneur-in-residence and former head of Sierra Nevada Corporation's space unit; and Kevin McLaughlin, the former deputy commander of U.S. Cyber Command. In their testimonies, the trio emphasized studies over the years that showed that reorganization of space capabilities within the department of defense was needed; calls for bipartisan support for building the new Space Force; and a belief that adversaries are already working to develop weapons to disable U.S. space resources, such as spy and communications satellites. There is an absence of norms of behavior for the military in space, and developing a Space Force could codify how to operate in that domain, the panelists said. The themes were echoed by further comments from Deputy Defense Secretary Patrick Shanahan, Principal Deputy Director of National Intelligence Sue Gordon, Joint Chiefs of Staff Vice Chairman Paul Selva and Under Secretary of State for Arms Control and International Security Andrea Thompson. The White House deputy director of the Office of Management and Budget, Russ Vought, also weighed in on the necessity of the Space Force. After the six recommendations for creating the Space Force were reiterated, Pence said that the council would likely next meet early in 2019. "With your help, with President Trump's continued energetic leadership, with the strong support of the Congress and the strong support of the Pentagon, our intelligence community and all the agencies represented here, I believe we will make history and we will launch the United States Space Force, and America will lead to a more peaceful and prosperous future in space for America and for all of mankind," he said.